This week at Take a Word the challenge theme is BALLOONS. I've chosen an old photo of my brother and me to begin with. I cut out the photo and sent the two of us to a beautiful beach, got some huge balloons and the smile was guaranteed. Background is a photo of mine; texture: Elné. so, so, you and your little brother in perfect scene! Fly away with the blue balloons! So wonderful! 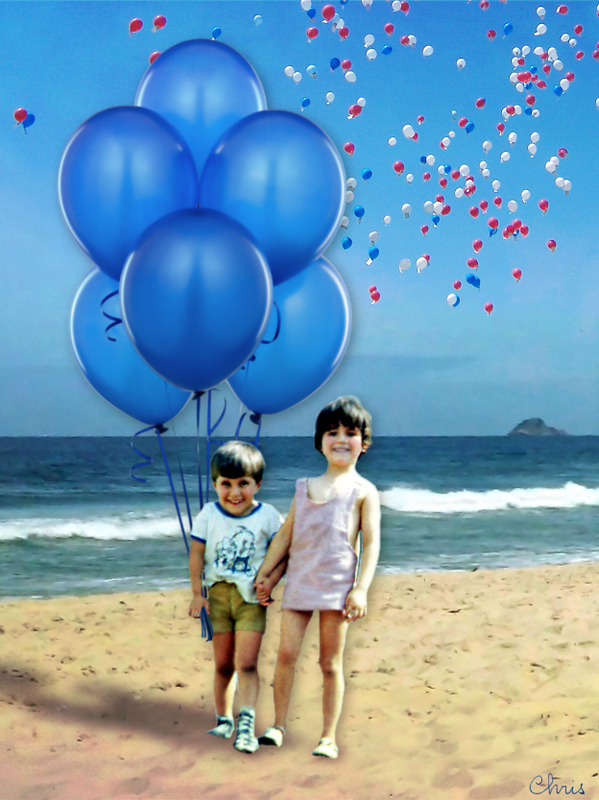 Herzlich P.
A lovely photo of your and you brother and with the balloons you have created a really beautiful piece. Ho, you were both so joyful! It's a great idea you often have to put your own photos into your collages Chris! You made magic with the photo, Chris, and captured memories of a happy time as well! Beautiful work. Memories are golden and what you have with balloons and a beach scene and your brother. Magical. A couple of cuties and a beautiful chop job on this well done. Wow, Miss Chris, this will make a lovely family history piece. Glowingly beautiful! What a cute pair. I love this gorgeous peek at your life as a child, Chris.